Pumpkin season is in full effect & it doesn't get any tastier than this! This recipe is one of my favorite ways to celebrate fall flavors. Perfectly pumpkiny yet creamy and savory at the same time. Whole foods never tasted so good!! There is a lot of misinformation regarding whether carbs or healthy or not. I'm here to tell you that the science shows carbohydrates from whole plant foods are extremely health promoting. White flour, white rice, white bread, and other refined carbohydrates lack nutrition and therefore should be avoided. But whole wheat pasta? Go for it!! Sprouted whole grain bread? Yes please! Beans, sweet potatoes, oats, and other whole grains? Absolutely! 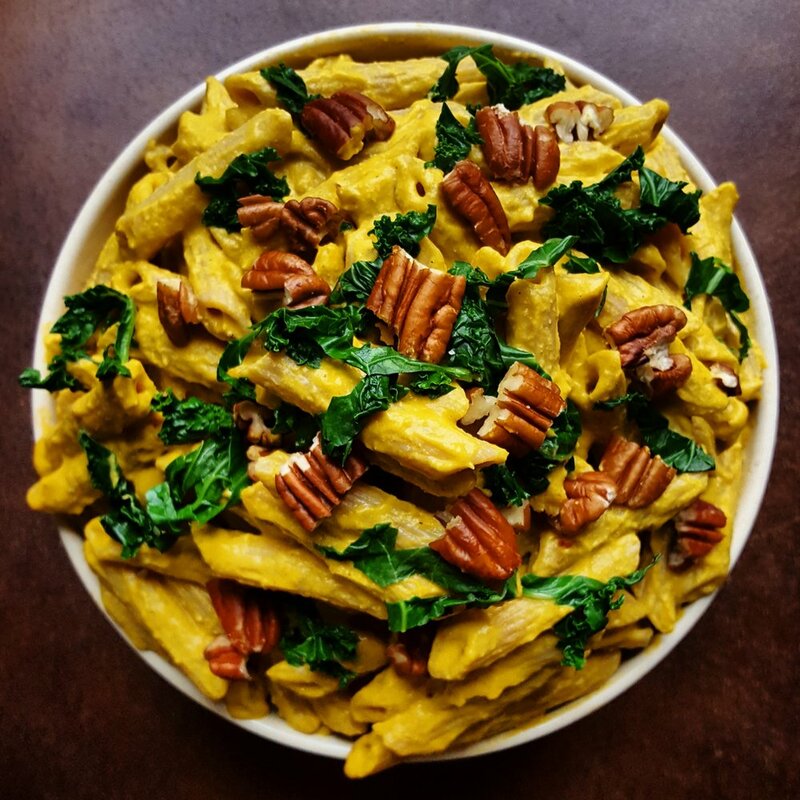 That's incredibly easy (and lip smackin' delicious) with this Pumpkin Alfredo Pasta!! Heat a pan on high for 2 minutes. Lower heat to medium and add onion. Dry sautée and stir occasionally for three or four minutes until it begins to become translucent. If it begins to stick, add a little bit of the water to the pan. Add garlic and sautée for another two minutes. Add pumpkin puree, water, cinnamon, and nutmeg. Simmer for 10 minutes. While the pumpkin mixture cools, boil water and make your pasta. Set aside. Transfer cooled pumpkin sauce to a blender with remaining ingredients. Blend until super creamy! Toss with pasta of choice and sprinkle with optional toppings. Enjoy all of the pumpkin goodness as it hits your taste buds!